IF there is one thing that makes a mockery of the opposition MDC-T’s neo-colonial politics, it is the coming together of the people of Zimbabwe like what happened on Tuesday at the National Sports Stadium and other parts of the country. After continuously failing to unseat the ZANU PF Government through democratic means, itself an antithesis of his repugnant politics, Morgan Tsvangirai has not only surprisingly tried, but dismally failed to persuade Zimbabweans to shun Independence Day celebrations through his frivolous claims that the people of this country are not yet free! Tsvangirai claims to be the advocate of democracy, yet when free people of this country enjoy the same, he laments the very tenet on which he claims his party is anchored. Democracy was brought to the country by freedom fighters and the masses of this country. Tsvangirai was never part of this process. Legend says he in fact fled the democratic making process. Just like on Tuesday, during the days of the liberation struggle, the people of Zimbabwe came together and took head on the formidable force of Ian Smith. It was all about unity, the unity which was exhibited on Tuesday. Tsvangirai and his co-Smith remnants resent the unity of the people of Zimbabwe. It was yet another exhibition of Tsvangirai’s hatred of people’s unity. 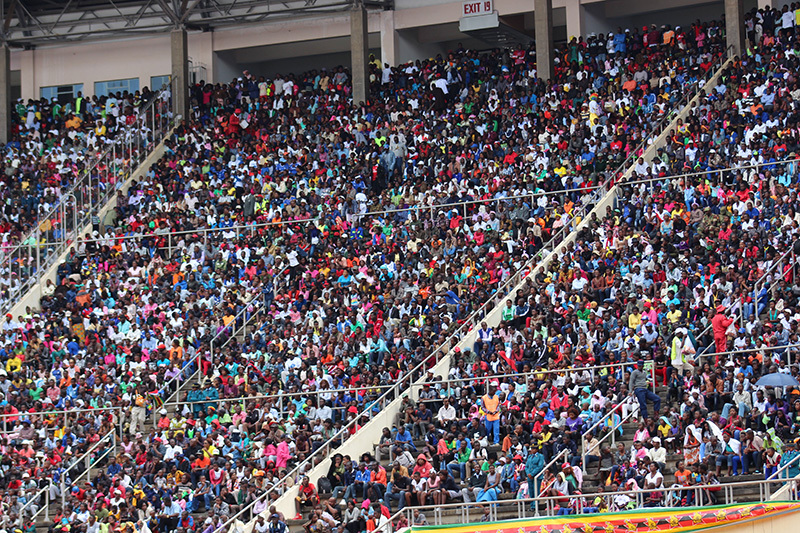 As thousands gathered at the National Sports Stadium where the main celebrations took place, Tsvangirai was at his usual best, attacking Zimbabweans for commemorating that historic day. “I would have taken my family to join thousands others for the national celebrations to pay homage to this country’s heroism in bringing independence. But alas, this important national day has been hijacked, pick-pocketed by the ruling elite,” Tsvangirai told a local daily. A decision-making crisis is what makes this man the leader we do not want in this country. The plan is always to scuttle that unity. So far it has been a desperately disappointing failure for Tsvangirai. After the monumental failure of his demonstrations in July last year, Tsvangirai’s MDC-T laid bare their plan for the destabilisation of the country. The MDC-T hastily arranged a press conference where its spokesperson Obert Gutu unwittingly revealed the party’s plan to cause anarchy in the country. “We have got a roll-out programme for all the provinces while in the meantime we will support every march and every demonstration,” Gutu said. But this is the same Mugabe who on Tuesday was laying the plan for the country’s prosperity at the National Sports Stadium. “As Government, we should continue to pursue development programmes and socio-economic policies that consolidate our true independence,” said President Mugabe on Tuesday. “Thus, Government has since Independence, put in place a number of programmes that are targeted at the transformation, sustenance and revitalisation of our economy. “The agricultural intervention programme we embarked on in 2016 is another case in point. It is a broad-based programme that seeks to transform our economy. It is two-tiered: Command Agriculture, which targets farmers with irrigation facilities and the Presidential Input Support Programme which subsidises inputs for our small-scale and peasant farmers, so they can speedily recover from the 2015-16 drought which had crippled them. Yet President Mugabe and ZANU PF are targeted and vilified by Tsvangirai and his Western handlers over the Land Reform and Resettlement Programme. In July 2008, the deposed British Prime Minister Gordon Brown, like his equally deposed predecessor Tony Blair, sought to gain political currency by presenting Zimbabwe’s land indigenisation as a global issue. It got personal and emotional. “I have this morning asked the Treasury to work with the Financial Action Task Force (FATF) to track the wealth and the assets that are owned by members of the Mugabe regime…so that we are in position to take tougher action at a later date,” Brown said at a monthly news conference. He claimed the assets were held in Asia, Africa and Europe. FATF is an inter-governmental body which tackles money laundering and terrorist financing. Zimbabwe, because of its land reform is now labelled a terrorist organisation, not a country simply fulfilling the objectives of the struggle that Tsvangirai has alienated himself from! So livid were the British that they started punishing anyone with the name Mugabe. It got embarrassing at times. Just like Tsvangirai shouting on top of his voice that Zimbabweans are not free! A person by the name Sam Mugabe had her wages ‘vanish’ in Britain’s banking system because of sanctions against President Mugabe and his alleged cronies. Her bank, HSBC, angry on behalf of the West, mistook Sam for a relative of President Mugabe and froze her 1 200 British Pounds pay cheque, a report by The Sun newspaper revealed. The media firm she worked for thought it was a computer glitch and arranged for her to be paid again only for the same to happen again. When all is said and done, no amount of senseless ramblings from Tsvangirai can destroy the people’s unity. 2018 is around the corner, he will surely have his day at the ballot.